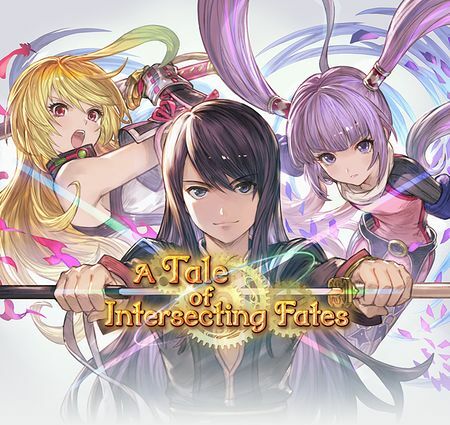 A Tale of Intersecting Fates is a side story which became available on September 28, 2018. It is unlocked after completing Chapter 16 Story - The Sacred Tree . It is a collaboration event with the Tales of Asteria mobile game. 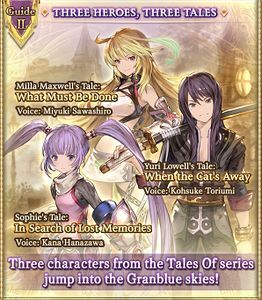 It is the first Tales collaboration event followed by A Tale of Skyborn Bonds. in essence the primal beast Vacheron. from the lands of Asteria. for a way to return home. Complete each chapter, quest, and challenge; each awards Crystal ×50 on first-time completion. 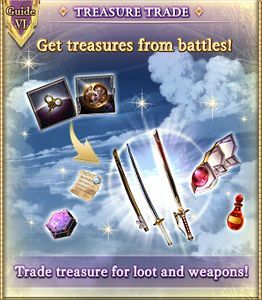 Purchase the 20× Half-Elixirs; they provide much more AP than is needed farm them. 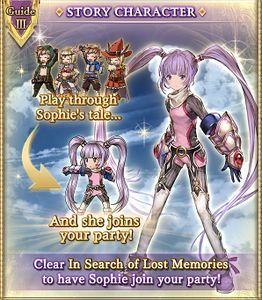 Sophie joins you after completing Chapter 1. 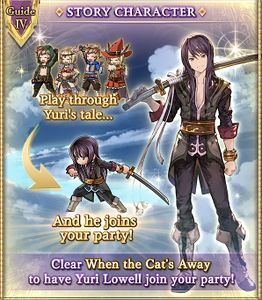 Yuri Lowell joins you after completing Chapter 2. 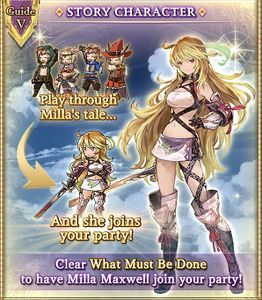 Milla Maxwell joins you after completing Chapter 3. Water damage to one ally. Boss must be defeated with a 3-chain burst. Use all skills except for Milla's 3rd skill and Sophie's 2nd skill on turn 1. Strength: 10%. Ignore the debuff and keep attacking to build charge bar. 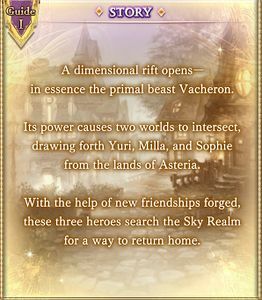 When Vacheron's charge diamonds are full, use Sophie's 2nd skill. Do not use Milla's 3rd skill until all three characters have at least 90% charge bar. At 90%, use Cloud Pierce to boost her charge bar to 100% and then toggle on Charge Attack. This page was last modified on 22 February 2019, at 14:59.